If you have purchased a particular software like Microsoft Office 2010 or Operating System like Windows 7, you might be knowing the importance of product keys. Product Keys are important for all paid software as you will need them in case you want to reinstall the software on your PC. Although you might get the product keys of individual software when you purchased them (from email), having a single file with all the product keys is better. 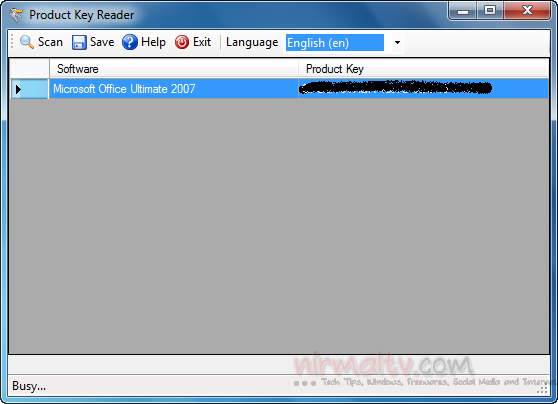 Product Key Reader is one such free tool to retrieve the product keys of all installed apps. The freeware app scans your computer for product keys of installed software and creates a list of it. You can save the list as backup in CSV format. This is pretty useful when you want to reinstall all apps after a clean install of your Windows. Product Key Reader supports currently over 100 programs and is able to read their serial numbers. You can find the list of supported programs from here.